If the slide into bourgeois bohemian middle age is signaled by weekly farmer’s market visits and excessive zeal for new kitchen gadgets, I am the avalanche. Unable to consume one more raw cherry and compelled to make a cobbler to address our bounty, I found myself without a cherry pitter. A quick trip to Sur La Table later, I was redecorating my kitchen in fuchsia splotches. I chose the OXO version, which while handsome, I can only partially recommend on account of the splattering and the fact that my husband nearly broke a tooth on the many pits I failed to remove. On a side note, is totally disturbing to me that the employees at our neighborhood Sur La Table know me by name, thanks in part to our wedding registry last year. Consumer capitalism gets you good when you get hitched—I’m still receiving an unsolicited, unwelcome copy of Brides magazine each month. Little do the power that be know, I was the most disappointing participant in the wedding industrial complex of all time. This county courthouse bride didn’t even manage register for a cherry pitter! 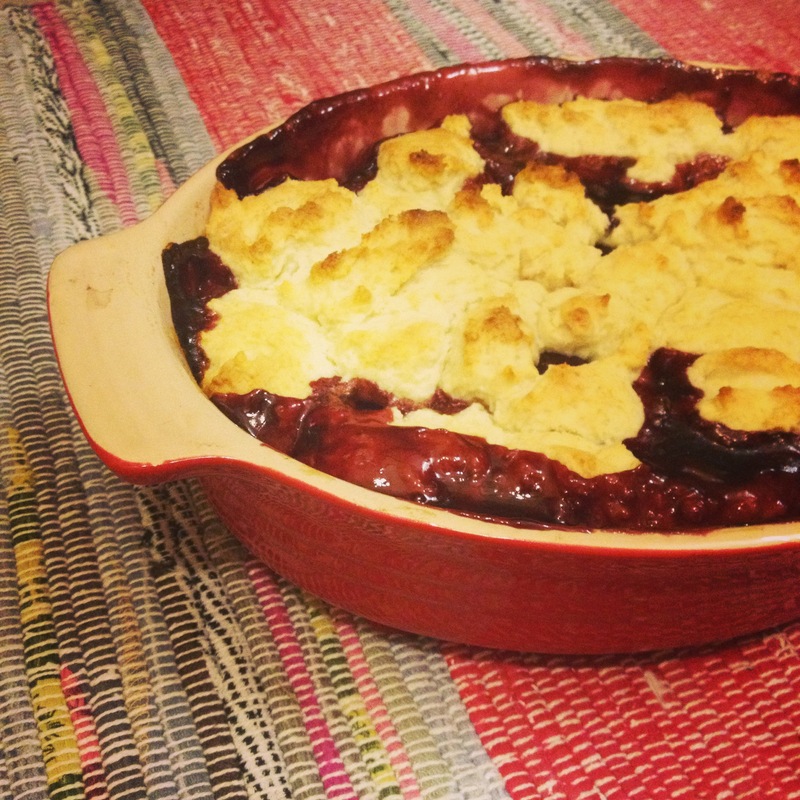 You probably already have a go-to cobbler recipe, but I thought I’d tap out mine. At some point my recipe was essentially a Joy of Cooking/Betty Crocker hybrid, one I cobbled together, wink wink. But it’s enough my own now that the specifics may be worthwhile if you find yourself with an excess of cherries, sweet or sour. 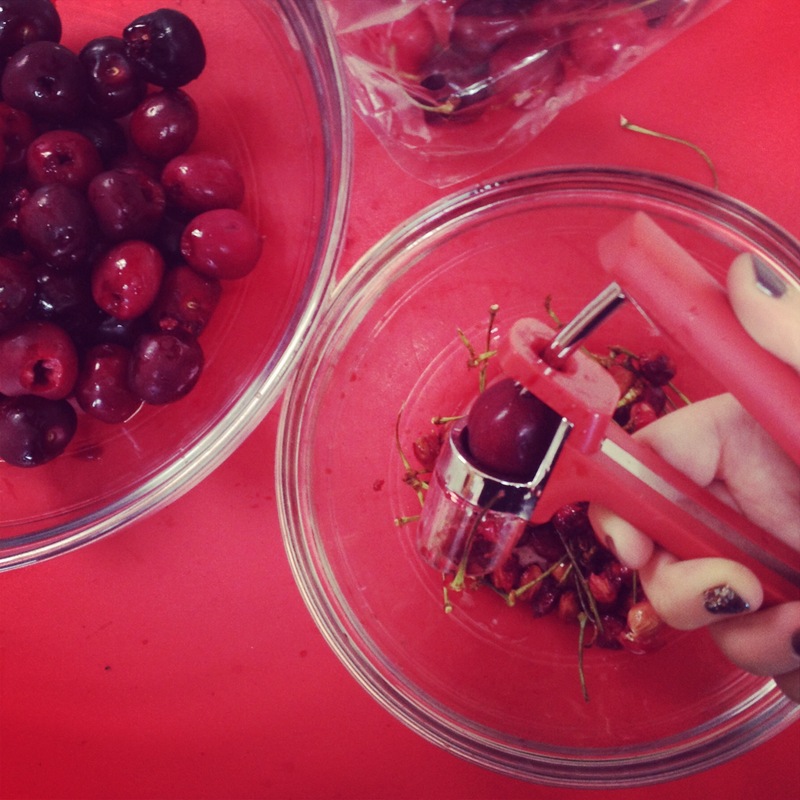 Pit those damn cherries. Bemoan the fact that your kitchen now looks like a shocking pink Pollack painting. Realize that you don’t have a lime. Steal a lime from your neighbor’s lime tree down the street. 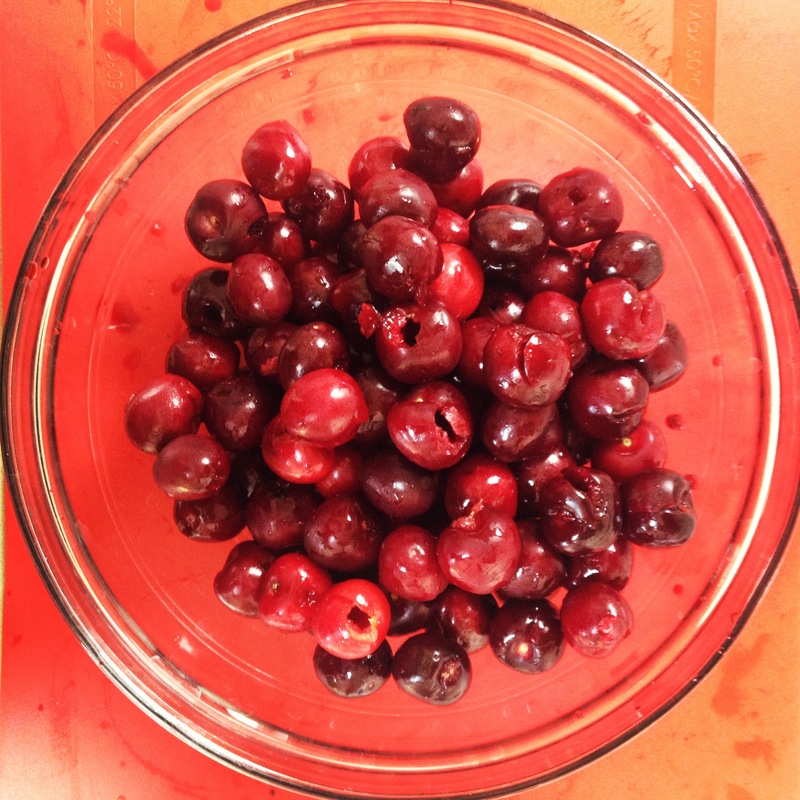 Mix cherries with 1/2 cup sugar, cornstarch, lime zest, and vanilla extract. 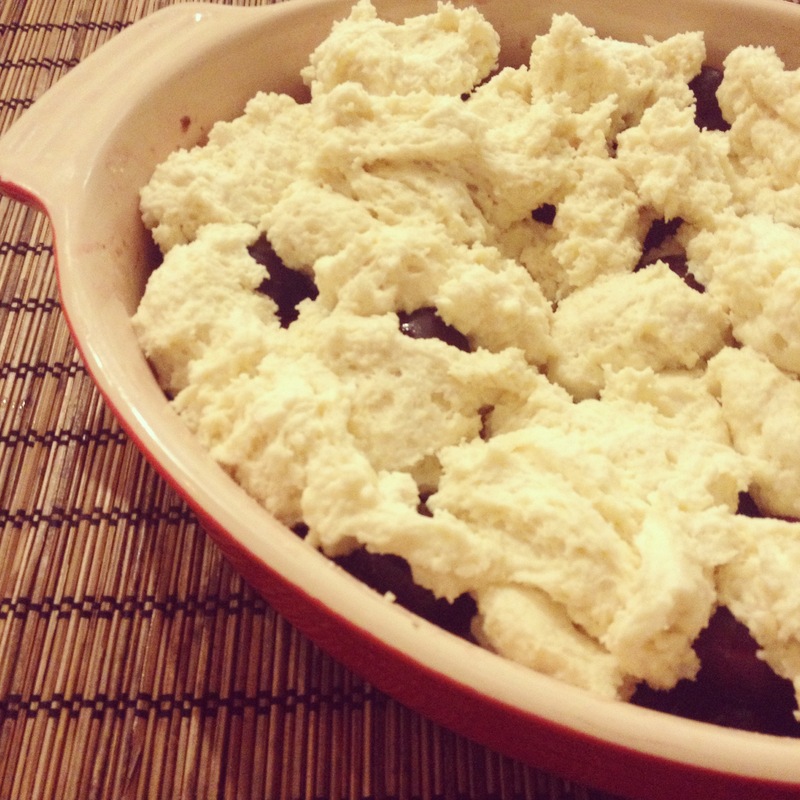 Pour into ungreased baking dish that will fit the whole damn things with a few inches to spare for biscuit. Cut room temperature butter into flour, 3 teaspoons sugar, baking powder and salt in medium bowl using a knife, until mixture look like fine crumbs. Stir in milk. By the spoonful, drop dough by onto filling mixture. Bake 35-40 minutes or until topping is golden brown and fruit juice is oozing up and appears to have thickened. Eat with vanilla ice cream. 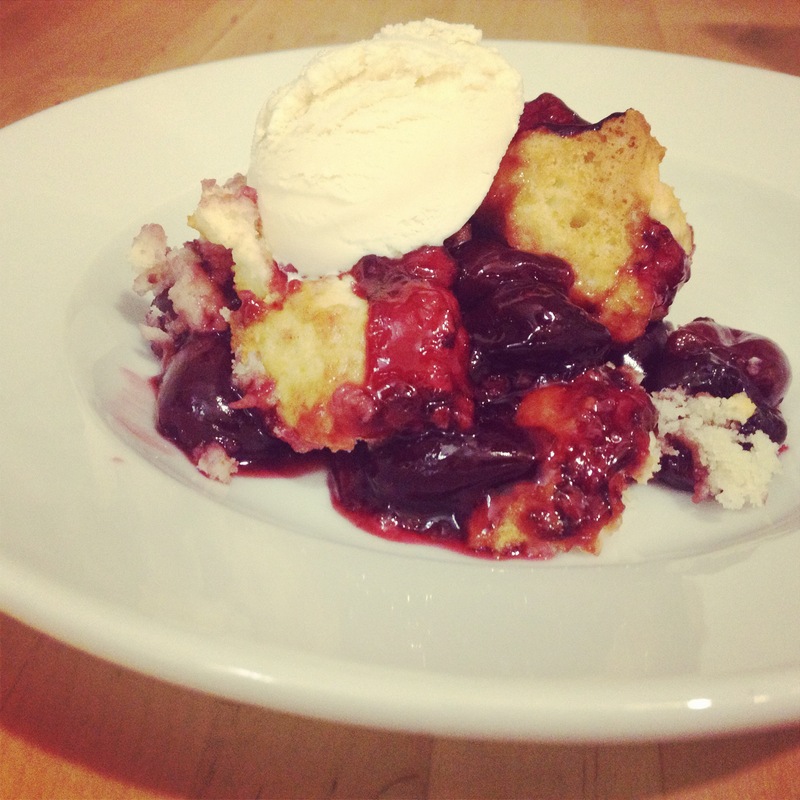 And cobbler for breakfast is the bee’s knees, duh.